Magnetracks | Manage, promote, license and distribute music. Manage, release, promote, distribute, succeed. Magnetracks is the most complete software for managing music available to songwriters and bands, creative teams and music companies of all types. 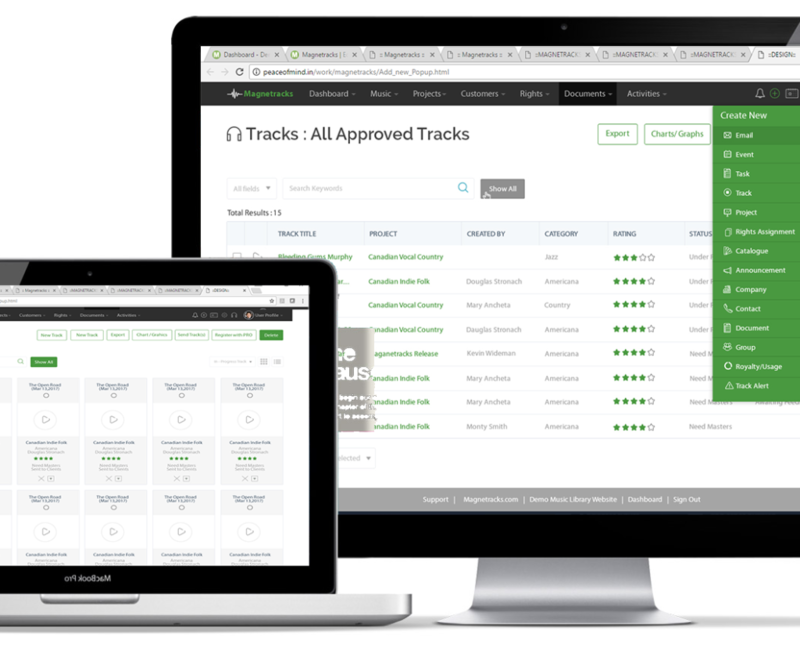 Right from idea to distribution, to contract and release management, Magnetracks has your entire musical journey covered. Your entire catalog in one place, including alt's, stems, and masters. License music, track digital and performance royalties, rejoice in your success. Magnetracks' guided A&R process makes sourcing music fun again. Easily send new releases to a growing list of platforms. Set up a project, assign tasks, monitor progress and hit your deadlines. With ArtistPortal, let rightsholders submit music, share comments and sign contracts. Built-in activity tracking helps you know your contacts and collaborators better. Fully-configurable visual dashboard brings your music, projects, pitching and other activities to life. Keep all your contracts, agreements, and important files connected to the things they're related to. Built-in integration with popular platforms like Box.com, SoundCloud, and your performing rights society keep you connected to the industry. Dead-simple tools to tweak Magnetracks to suit your musical empire. Apologies to your IT guy. Whether you're just starting out or are a chart-topping megastar, you've got musical assets worth organizing and protecting. You also need powerful-yet-straightforward tools to promote and distribute your music that make it clear you've got your act together. Magnetracks makes it easy for creative collaborators to share your work, collect feedback, manage tasks, and centralize contracts and metadata. You also need to distribute polished mixes through industry-standard delivery channels. You've found your solution. Your reputation of delivering great music on-time and beyond expectations depends on whether you can stay organized and schedule effectively. Magnetracks just raised your game. You've got rightsholders to manage, licensing to administer, and relationships to protect, all while trying to maximize the revenue of a constantly-evolving music catalog. You need a way to report on anything and tools you can run a business on. Not the next shiny thing. You have anywhere between three and three thousand composers, artists and producers that need quick and easy access to your production projects and callouts. Turnaround times are short, and you need an efficient workflow from demo submission right through to cleared, production-ready track. A successful commercial studio depends on efficient scheduling, simple and efficient file and contract management capabilities, and an easy way to post mixes and collect feedback. Magnetracks scores on all fronts. Talk is cheap and there's just no substitute for a test drive. Try Magnetracks with no obligation for 30 Days.